It's no secret that heels are hardly the best shoes for our feet. Between the plethora of research to back up the claim or, you know, your own personal experience with a pair of heels causing your feet some major discomfort, we've come to terms with the notion that pain equals beauty—or in this case, fashion. But why should that be the default for so many of us? The fact is, heels will always have a place in fashion girls' closets because, well, they're always a stylish, timeless option. Even though heels may get a bad rep for destroying our feet, it's still unlikely we'll be throwing away every pair we own that happens to have a heel higher than one inch any time soon. Instead, we did some investigating and found out which of the current heel trends on offer are more or less okay for our feet. Think of these heel trends as happy mediums—they'll add that bit of height without killing your feet. Podiatrist and Gotham Footcare founder Miguel Cunha weighed in on the seven top heel trends of the moment, sharing which he'd be overjoyed to see you wear—and which he advises avoiding like the plague. From modern architectural heels to buzzy '90s-inspired "floss" sandals, the doctor shared his unfiltered thoughts on the matter. Keep reading to discover and shop the best (and consequently, the worst) heel styles for feet. Why: "A platform on the heel allows the wearer to increase height without compensating the arch. However, the height difference between the front and back of the shoe should be no more than an inch. The advantage of the platform shoes like these, for instance, is that it has ankle straps which provide some support to the foot and ankle and it has a platform of one inch, which masks the incline of the heel from four inches to three inches." Why: "These sandals have a flimsy heel and no supportive structure to the shoe even though they have an ankle strap. Even though this shoe has a heel height of two and a half inches, this shoe easily lacks structure, can bend easily, and get stuck in a sidewalk crack, leading to a bad ankle sprain." Why: "I don't mind non-traditionally shaped heels. I prefer a heel regardless of its shape if it has increased thickness than a traditional heel, as it will provide more surface area to support the foot and ankle. The advantage of these architectural heels is that they have a wider surface area than regular stilettos. Shoes like these have a heel that's slightly larger than my comfort zone, which doesn’t make it the worst shoe, but I would prefer if this one had an ankle strap for increased support." Why: "When shopping for a block heel, try not to surpass a heel height of one and a half inches. Wearing a shoe with a short heel places less tension in the Achilles tendon and will feel more comfortable. When looking for block heels or a brogue shoe, it is important to not only pick the right heel height but also to look for one with a wider toe box to accommodate the toes comfortably. These slingback styles have an ankle strap and are typically only 0.5 inches above the acceptable height of a heel. Heels with ankle straps help support the shoe on the foot and eliminate the need for your toes to hang onto the shoe." Why: "I prefer pyramid heels over traditional heels due to the increased thickness of the heel, which provides more support. However, this heel is 4.1 inches, which is far greater than one and a half inches, the acceptable height for a heel. This shoe is only slightly better than the floss heel even though it has a greater heel height because at least it has more structure, making it less flimsy. Nevertheless, it is not an ideal shoe because of its heel height." 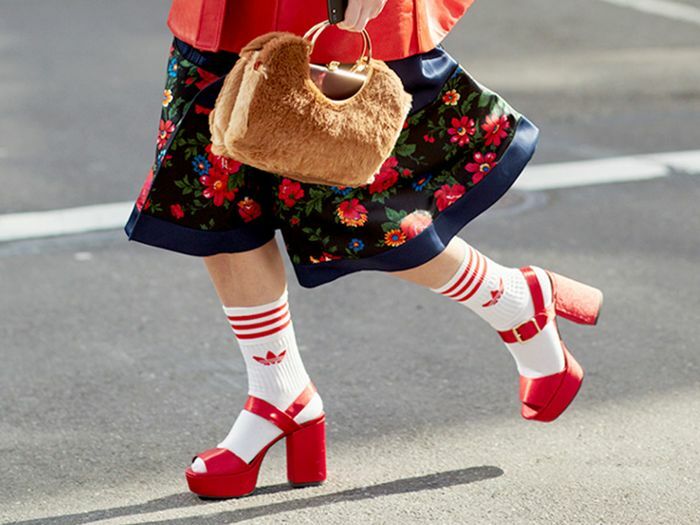 Why: "Loafer heels may not be the most beautiful shoe, but they're definitely the most acceptable and comfortable shoe in this list as it has a one-inch heel and an enclosed frame. The only issue to consider is the forefoot space of the shoe and making sure that it is comfortable enough." PSA: My podiatrist also shared his unfiltered thoughts on the best and worst sneaker trends for your feet.